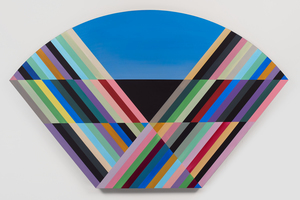 Helwaser Gallery is pleased to present VIEWs, the first solo exhibition of works with artist Anton Ginzburg. 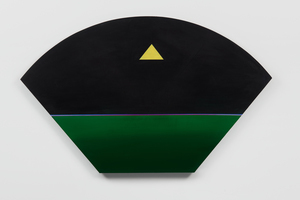 The exhibition introduces the newest body of works by the artist, which includes the VIEW painting series, a site-specific mural, and ceramic sculptures. VIEWs presents Ginzburg’s engagement with the development of modernist-formal vocabulary in Eastern Europe, which addresses theories of viewing. 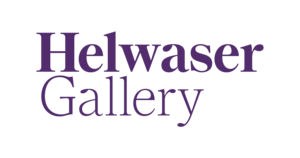 Marking the inaugural exhibition at Helwaser Gallery’s new location (833 Madison Avenue, Third Floor), the show will be on view March 28–May 23, 2019, with an opening reception to be held Thursday, March 28, 2019. 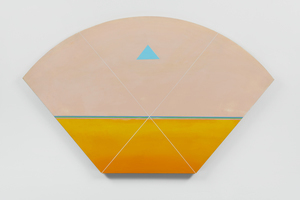 The core of the exhibition is the VIEW painting series. 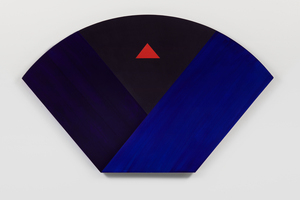 Executed on wooden panels of two distinct sizes, each work references diagrammatic representations of the binocular field of human vision. 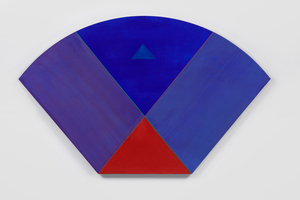 Based on the shape and geometry of the panels, abstract compositions are developed through color, plane, and line. 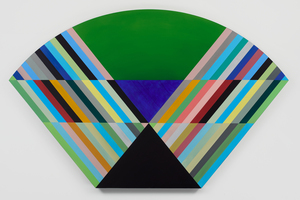 In smaller-scale works, different planes of color overlap and intersect with each other, demonstrating the figure and ground perception within each work. 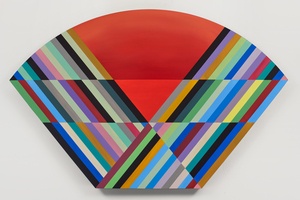 In larger works, Ginzburg draws on the effects of the movement of color through space. 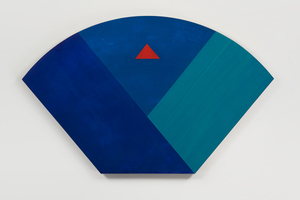 Collectively, the VIEW series analyzes the act of viewing and demonstrates the process through the material practice of painting. 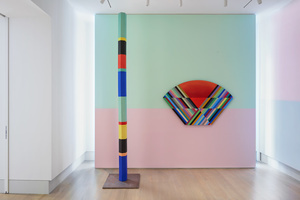 Also on show are Polychrome Column 10A_01 (2019) and Polychrome Column 10A_02 (2019), a pair of multi-colored porcelain sculptures measuring 10 feet in height. 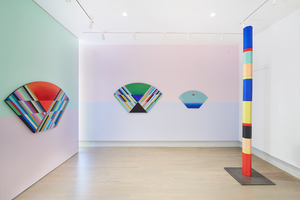 Segmented into different colored modules, which are stacked on top of each other, the columns introduce a spatial dimension to the exhibition. 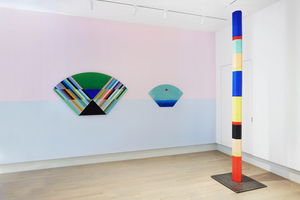 Accompanying these columns is a site-specific mural, comprising bands of colored lines with mirrored, glass pieces superimposed over it. 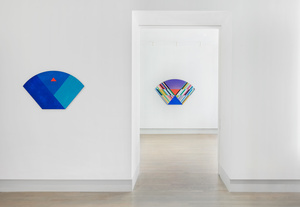 Placed in dialogue with the space of the gallery, these works create a dynamic viewing process, allowing visitors to immerse themselves within the works. 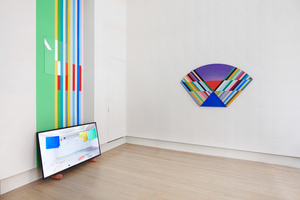 Also presented in the exhibition, the artist’s earlier video work Color and Line (2013) echoes this notion of space. 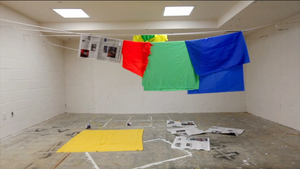 A playful interpretation of Suprematist paintings and cinematic structure, the work was filmed in a laundry room, in between “cuts” of darkness (achieved by switching on and off the lights), creating a continuous sequence of color compositions that vary in placement. 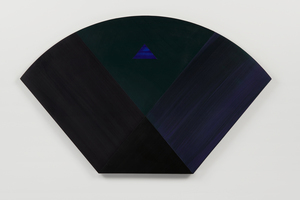 Ginzburg’s practice explores the direct relationship between the viewer and the process of observing. Through referencing theories of viewing proposed by two artists of historical avantgarde, Mikhail Matyushin and Władysław Strzeminski, Ginzburg applies his own methodology to painting, sculpture, and video. 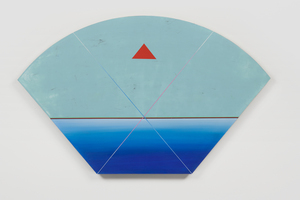 This inquiry began three years ago during Ginzburg’s residency in Canada in 2016, where the artist engaged in visual exercises used in the curriculum of the VkHUTEMAS (a modern art and technical school established by the Soviet Union in 1920). 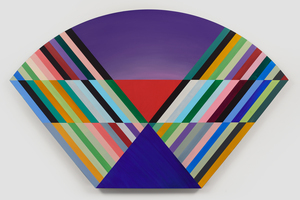 These exercises included color and spatial studies, photography, and graphic explorations, which strived to re-animate the avant-garde methodology of the 20th into the present-day context.